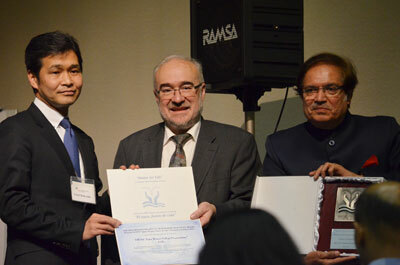 The 2014 edition of the 'Water for Life' UN-Water Best Practices Award focused on the theme of Water and Energy and was presented to winners during the World Water Day 2014 UN celebrations in Tokyo, Japan, on 21 March 2014. Mr. Seishi Kohyama, Mayor of Kumamoto City, Japan, and Mr. Michel Jarraud, UN-Water Chair, present Category 1 Award to the representative from International Water Management Institute (IWMI)-Tata project (ITP), India. The Award was introduced by Mr. Michael Jarraud, Chair of UN Water, followed by Ms. Josefina Maestu, coordinator of the UN-Water Decade Programme on Advocacy and Communication (UNW-DPAC) who then presented a video summarizing Award candidate projects. Ms. Josefina Maestu gave a summary of the exhaustive process of selection, and highlighted winning initiatives of previous editions including projects from Durban in South Africa, Las Piñas/Zapote in the Philipines, Bangalore in India, Cochabamba in Bolivia, Kumamoto City in Japan, and the Republic of Moldova. Introduced by Mr. Seishi Kohyama, Mayor of Kumamoto City, Japan, the winning city of the 2013 edition, the winner of the 2014 edition Category 1 'Best water management practices' award was the International Water Management Institute (IWMI)-Tata project (ITP), India. The jury decided to select this practice for 'directly tackling the socioeconomic environmental challenges related to the improvement of the energy-irrigation nexus by engaging with various stakeholders and for its strong potential for replication'. 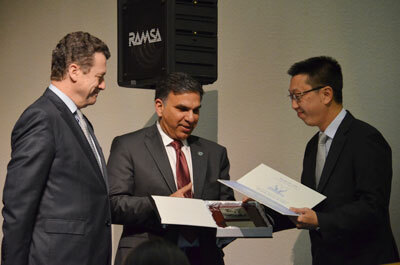 Mr. Miguel Angel Navarro, Ambassador of Spain to Japan, and Mr. Zafar Adeel of UNU, President of the 2014 edition, present Category 2 Award to the representative from NEWater Project, Singapore. Introduced by the Ambassador of Spain to Japan, Mr. Miguel Angel Navarro Portera and Mr. Zafar Adeel of UNU, President of the 2014 edition, the winner of Category 2 'Best participatory, communication, awareness-raising and education practices' award was the NEWater Project, Singapore. The jury selected this practice 'for its strong social component and enduring partnerships in its manifold and remarkable water management practices contributing to Singapore's water and energy sustainability'. Mr. Michael Jarraud noted that in reaching its fourth year, the award had so far helped to bring recognition to some highly successful projects, working innovatively in important areas of sustainability within the Millennium Development Goals (MDGs).